Efficient welcome/check-in and departure. 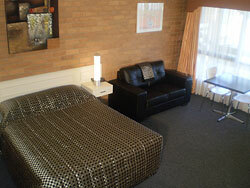 Comfortable rooms; all clean and ready to use. Overall very good experience. Location was ideal for work at Essendon airport. One of the best beds of any accommodation that I have stayed in, soft/good sheets, Negatives- needed bath mat/face washers but these are minor complaints Happy to stay again, and will do so! It was pleasant, we only used the room. The bathroom was a great size with plenty of room unlike other motels where they are tiny. Overall good for us, the decor could be updated. overnight stay was suited to our requirements,thank you. Lovely big family room. Great value for money. Nice to be able to get a family room that doesn't cost a fortune. I stayed here for business purposes and it was fantastic. The room was spacious and very clean and allowed me to do work in comfort. My training was at Essendon Fields, so the location was great. I cannot compliment the staff enough, they are fantastic. The meals in the restaurant were very good and nothing was too much trouble. The room was very comfortable. The fridge was a little noisy but generally very good. Unfortunately the people staying in No 18 were noisy late at night when I was trying to sleep before a big day the next day. But that was no fault of the hotel. The staff were very helpful and pleasant.